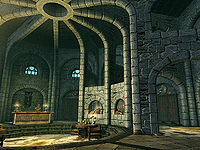 The Arcanaeum is the library located within the College of Winterhold, zealously maintained by Urag gro-Shub. Collated over hundreds of years, the College's library contains a wealth of information, placed at the fingertips of those who require them - albeit under the ever-watchful eye of Urag gro-Shub. It is located on the first floor of the main college building, between the Hall of the Elements and the Arch-Mage's Quarters. If you choose to join the College, you may find yourself adding significantly to the collection of books available, and perhaps even be gifted with some as rewards. Forgotten Names: Summon the Dremora pirate, Velehk Sain. Illusion Ritual Spell: Find some books about Illusion magic to further your Illusion skills. There are a total of four entrances to the Arcanaeum; one from the antechamber in front of the Hall of Elements, one from the Arch-mage's Quarters, and two from the roof of the College. It is a large circular room with large covered, locked, and non-respawning bookcases lining most of the walls. By the entrances are a total of five bookcases that can be accessed; however everything in the Arcanaeum is owned and taking items is considered stealing. There is a mammoth tusk on top of one of the unlocked bookcases with a round wooden table and chairs nearby. There are many tables and chairs arranged in small group around the room with stacks of common and less common books on every available surface. There are many bottles of alto wine and wine with goblets on the tables, but strictly no food. The counter is at the far end where Urag gro-Shub can always be found, overseeing anyone within the Arcanaeum. He is very protective of the books found in the Arcanaeum and will repeat warnings to take care of any books found here every time you talk to him. With the Arcane Archer Pack Creation installed, Spell Tome: Telekinesis Arrows and Telekinesis Arrows Research Notes can be found atop the counter next to Urag. Under the counter are two bottles of Nord Mead and behind it against the rear wall is a locked display cabinet containing four rare books; however the lock cannot be picked and no key exists in-game to unlock either the bookcases or the display cabinet. Further around to the left is the non-respawning investigator's chest which is Master locked. The key to open it is found on a table in The Midden along with a copy of the Midden Incident Report regarding the disappearance and subsequent deaths of four previous students. Inside the chest are four rings that are needed for the gauntlet in The Midden, as part of the unmarked quest Forgotten Names. There are partition walls segregating the outer ring of the room from the central reading area. You will often find one or more of the college trainers in the Arcanaeum reading. Urag gro-Shub, like other Orcs, is able to make you Blood-Kin to the Orcs, once you have completed a couple of quests for him. Urag will sell you a variety of books that weren't fit to be added to the Arcanaeum's collection. When completing the quest Alduin's Bane, you can sell the Elder Scroll to Urag for 2000 gold. However, if you have Dawnguard add-on installed you will need the Elder Scroll for this questline. You can buy it back from him if needed but you will not be able to sell it again. Like all other bookcases in Skyrim, the books can be read from the bookcase with no repercussions, but as they are marked as owned, taking them is considered stealing.